KFC Famous Bowls: America’s failure pile with bacon! Is it possible that the failure pile in the sadness bowl could get even sadder? One of the most bewildering fast-food marketing successes, the KFC Famous Bowl, has added BACON to the mound of mashed potatoes, gravy, chicken bits, corn and cheese, and behold! The KFC Cheesy Bacon Bowl. It seems KFC is good natured about Oswalt’s hilariously devastating commentary on its best-selling product; the Colonel’s social media team even went so far as to engage the comedian on Twitter as the Cheesy Bacon Bowl launched. @kfc_colonel Hey, @pattonoswalt: Regarding the new material for your act, you're welcome. #BaconBowls. // You've become 100% vengeance. At the time of this writing, the KFC ad, posted Oct. 14 on YouTube, had 33,648 views, 44 likes, 13 dislikes and 53 comments. UPDATE 12-06-2011: It has since been pulled. I﻿ want to be an American. Does that mean I have to be fat first? Yes, Adam. I believe it’s in the naturalization laws. Categories: advertising, marketing | Tags: dining, famous bowls, fast food, food, food marketing, kfc, marketing, patton oswalt, YouTube | Permalink. ED’S NOTE: A guest post from my better half. Originally posted at A Few Things Considered. I’ve had a long love affair with fried chicken (I am a Southern boy, after all), and I’ve savored it at places that are considered legendary (Price’s Chicken Coop in Charlotte, among many others). But I may have discovered a place that puts them to shame: Bon Chon Chicken in Fairfax City. This might — might — be the best fried chicken I’ve ever tasted. Bon Chon is a popular South Korean restaurant chain that specializes in KFC — Korean fried chicken. The Korean style of frying up yardbird is a two-step process, according to this article from The New York Times. The result is sublimely crunchy. In fact, it’s the most perfect crunch I’ve ever experienced from fried chicken. The only downside to this process: be prepared to wait a while for your food. The chicken comes with two sauces — soy garlic or spicy soy garlic. I opted for the spicy, which had a wonderful kick, but was not overpowering. And unlike a lot of American wing places, the sauce is applied gently and is not messy. The side dishes and appetizers looked interesting, but I didn’t try any on my first visit. If you live in Fairfax, you’ve got to try this place. Now. Hours: Sunday, Monday: 4 p.m.-10 p.m. Categories: Dining, Korean food, Northern Virginia | Tags: bon chon chicken, dining, Fairfax, food, korean chicken, korean food, northern virginia | Permalink. Emma Barnett of the UK’s Telegraph talks to foursquare chief Dennis Crowley about the location-based network’s 7-month-old rivalry with Facebook’s Places. 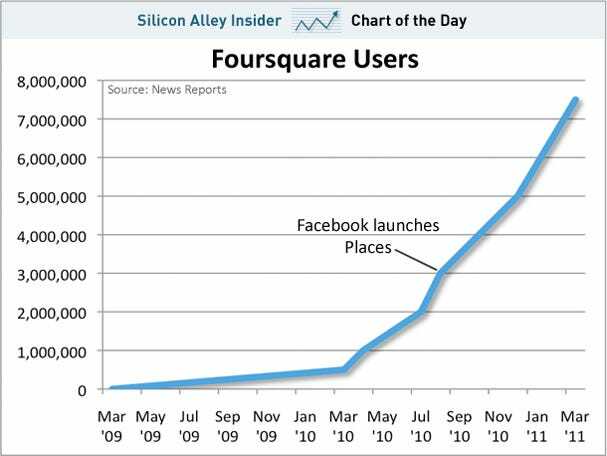 Crowleys says Facebook’s no threat to foursquare, which saw a 3400% growth in 2010. We offer a fundamentally different tool to Facebook Places. Facebook is very good at offering its users tools for sharing things online. We are good at facilitating activities offline, once a person has shared their location online. Our primary aim to get people outside and doing more stuff. I’ll buy that. But I wonder, if Facebook isn’t a threat to foursquare, what about Google? EARLIER: A Business Insider graph looks at foursquare’s growth. A foursquare post claims 7.5 million users now, and as Business Insider points out, that’s more than double their number of users when Facebook’s Places launched in August. What location-based platform are you using? Categories: advertising, business, ecommerce, Facebook, foursquare, Google, l-commerce, marketing, Media, mobility, mobility, social media, social networks, tech | Tags: advertising, dining, ecommerce, Facebook, foursquare, Google, hotels, lcommerce, marketing, mobility, mobility tech, social media, social networks, technology, travel | Permalink. Affordable food. Friendly service. And cold beer. We’ve enjoyed Hard Times Cafe since 2001: When we worked in Rosslyn, we used to stop at the one in Clarendon after work, then years later the Fairfax store opened around the corner from our then-new neighborhood, and that made for a nice welcome. Don’t live in Arlington? Not in Fairfax? Don’t worry, Hard Times Cafe has 16 locations in the D.C. metro area. You can find them here. Hours: 11 a.m. until 1 a.m.
Sports Cue closes at 2 a.m. Categories: Dining, Food | Tags: beer, chili, dining, food, wings | Permalink.